Wigan Athletic's FA Cup-winning skipper Emmerson Boyce has revealed he suffered with depression after calling time on his playing career in 2016. In an exclusive interview with the Bucks Herald - sister paper of the Wigan Post - Aylesbury-born Boyce opened up about life after football. The 39-year-old is now involved with various football projects and enjoys spending time with his children. "I found the transition from playing football to not playing the game anymore hard," said Boyce. "I struggled with a bit of depression when I retired but I had good people around me to help me. "The important thing to remember and the message I am constantly pushing out is that there are organisations that can help if you are going through a dark time. 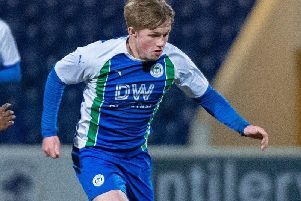 "I have got involved with various projects - I have been working at the Wigan academy for the past six or seven months helping some of their youth players, I have joined the Wigan Athletic Community Trust board of trustees, and I am working towards my coaching badges. "I have done a bit of radio work for BBC Manchester and I wouldn't rule out TV punditry in the future." Boyce's sporting pedigree seems to have been passed on to his children - Jayden, 12, Kylan, 11 and Amaya, seven. He explained: "Jayden is currently at the Wigan academy, Kylan is a keen golfer and Amaya she is fearless - she's a great tackler when she plays football! "I would never push any of my kids into doing football - if they want to then great - but it's for them to choose the path they want to pursue." Boyce looks back fondly at his nine seasons at Wigan Athletic, which included winning the FA Cup in 2013. He said: "Winning the FA Cup was a great achievement - it is the only time Wigan have won the competition and it was very special. "We went on to get relegated but people in the town just talk about the cup win. "We obviously went on to play in Europe, which was amazing for a club like Wigan, and we had another great run to the semi-finals a year later." Boyce, a citizen of Barbados, received a Barbados golden jubilee award in 2016 - these awards are given to Bajans who have contributed to the UK. Other winners include pop star Rihanna, singer Sir Cliff Richard and former West Indies cricketer Gordon Greenidge. Boyce said: "Winning that award was a very proud moment for my family - only about 50 people have such an award so to be on a list alongside people who are great in their field is a real honour." Boyce is very proud of his family's Bajan roots and is passionate about making football as diverse as possible. He said: "I went to a big diversity event two years ago in London and there was a big focus on ethnic minorities in football. "I think the platform is there for people of all backgrounds to get involved in the game and progress is being made on that front." Boyce still takes a keen interest in the local football scene back in Aylesbury, visiting the town regularly. He said: "When I drive past Aylesbury United's old ground it saddens me that it is empty and that it looks in such a sorry state." Boyce also remains a proud ambassador of the Wigan-based Joseph's Goal charity and will be leading next month's fundraising walk to Leeds, as well as captaining the Latics Legends in their clash with Manchester United Legends on May 25.